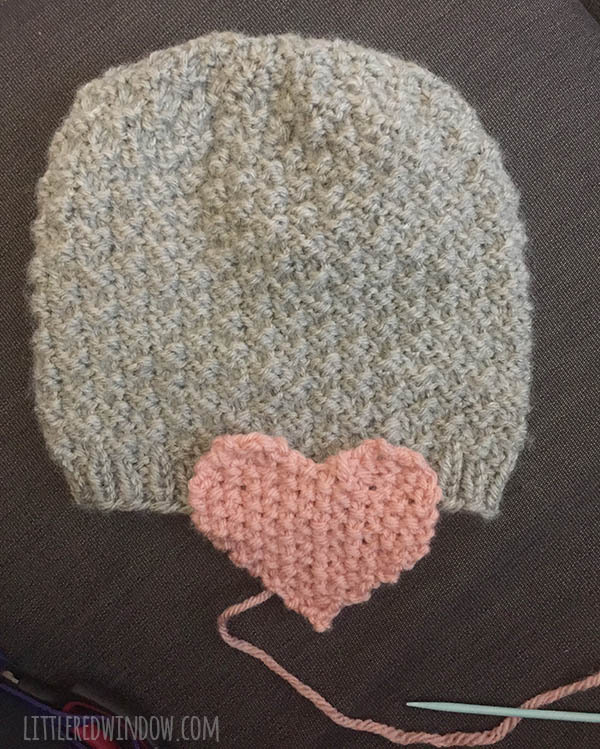 Knit your little one a cute (and warm!) 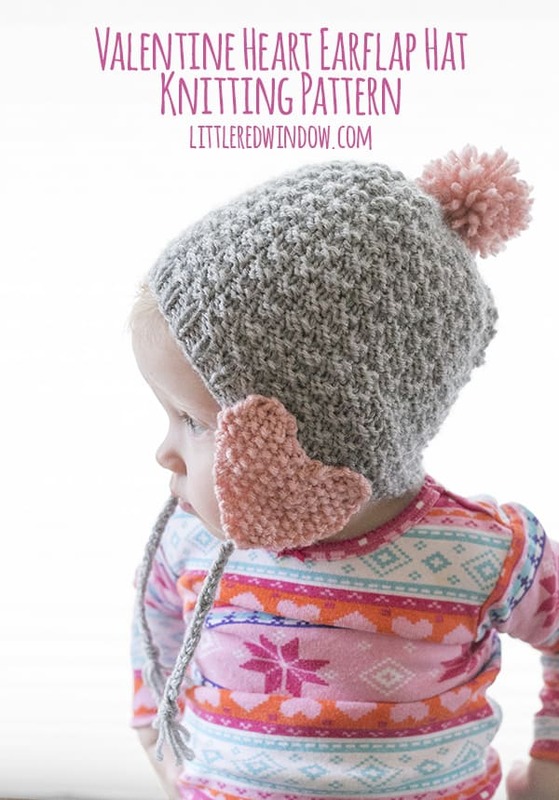 Heart Earflap Hat with this easy knitting pattern. I think I have a problem. I kinda can’t stop with the Valentine’s Day hats. The nice thing about Valentine’s Day is hearts and love work all year round. So your little one can keep wearing it all winter. Of course the day I finished this hat, I checked the weather report and it’s supposed to be in the 50’s this weekend. In January. I’m not sure how I feel about that. 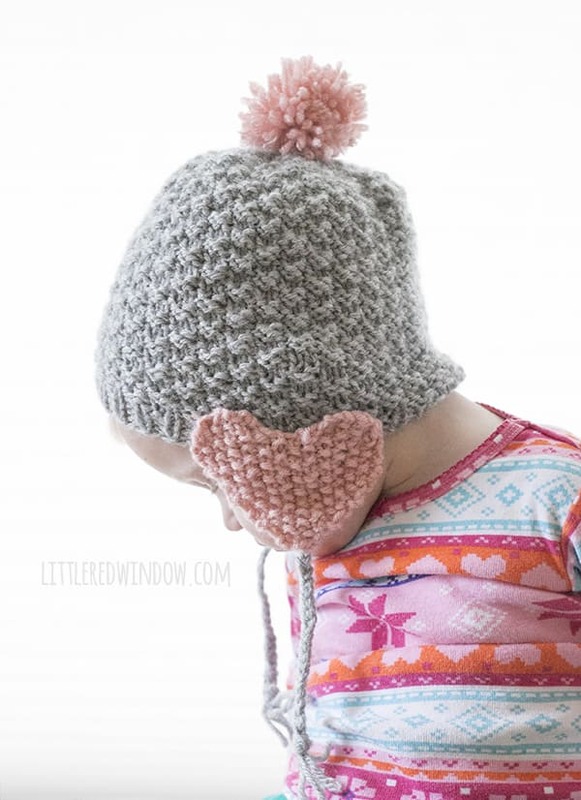 But anyway, this heart earflap hat is cute and I always love a hat with earflaps for little ones because they stay on better. Plus it has a pom pom! Pom poms are the best. It’s a fact. 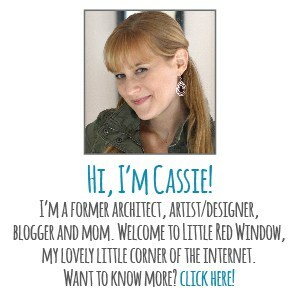 Scroll on down for the pattern! 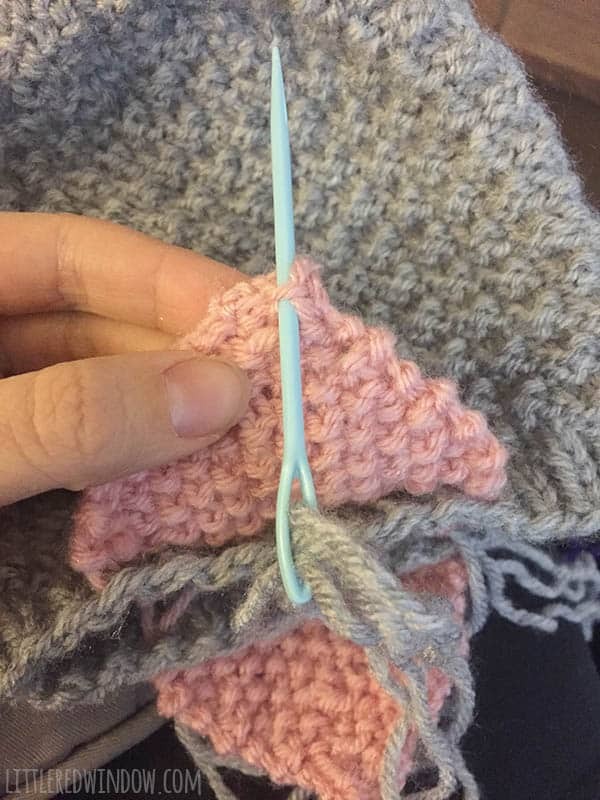 Using a long-tail cast on, cast on 64 stitches onto your circular needles with the gray yarn color. 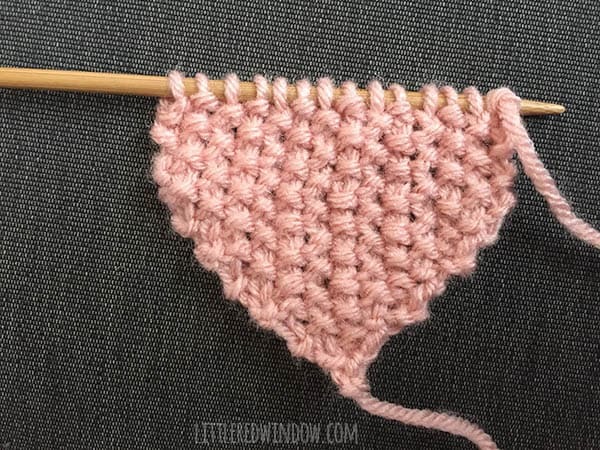 Join to knit in the round and k1, p1 in a rib stitch for 5 rounds until the last 2 stitches of the 5th round, then kfb, pfb to add two stitches and make the double seed stitch pattern repeat properly. Repeat rounds 1-4 in a double seed stitch until the hat is 4 1/2 inches long. Start decrease after a round 4. 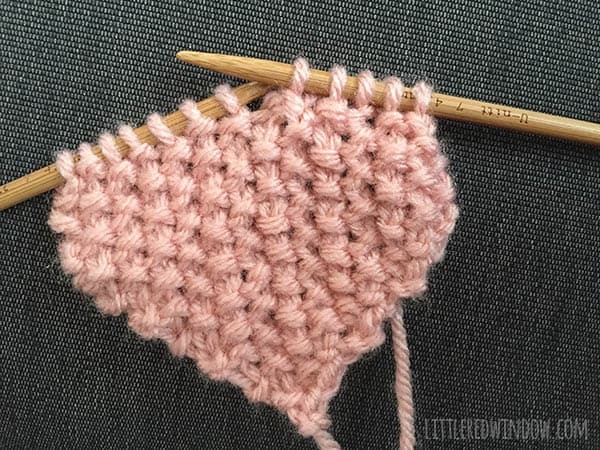 Using 2 double pointed needles as straight needles, cast on 1 stitch with the pink yarn. 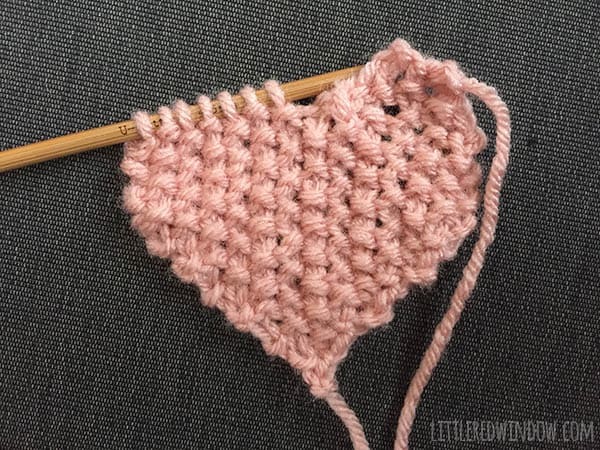 To make the tops of the heart, work rows 21A – 23A with only the first 7 stitches on the needle. Move the other 7 stitches to a stitch holder or leave them on a spare needle, you will come back and work them next. 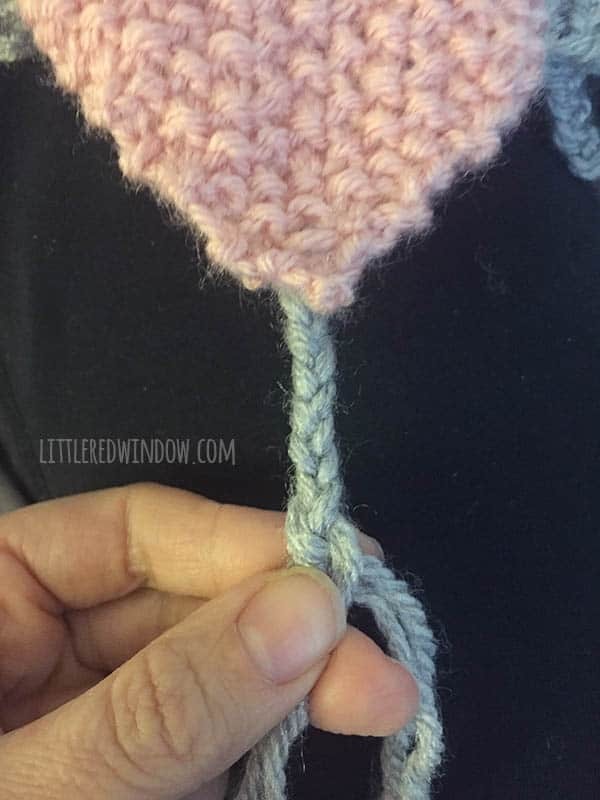 Sew the heart earflaps to either side of the hat with a length of pink yarn. Then cut 6 pieces of yarn 18 inches long. 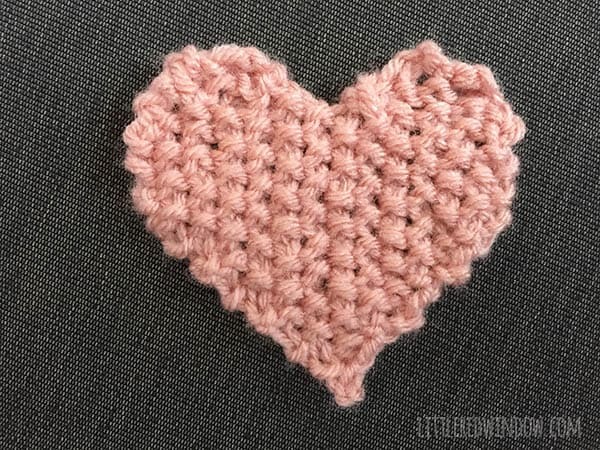 Thread 3 of the pieces on one yarn needle together and thread them through a couple of stitches on the back of one heart earflap. 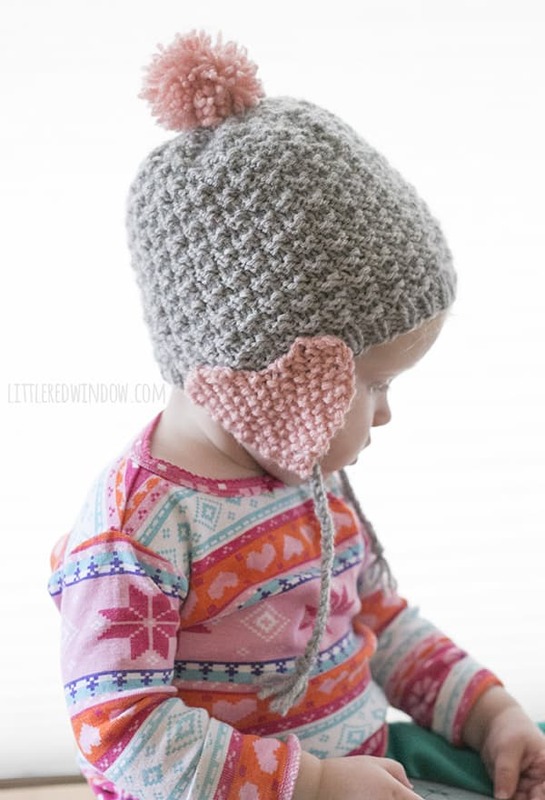 Pull them through halfway so you have 6 even strands dangling from the earflap. Then braid those six strands all together until the braid is about 6 inches long. Tie the braid in a knot and cut the ends to make a little tassel. Repeat with the other 3 18-inch strands and the other earflap. 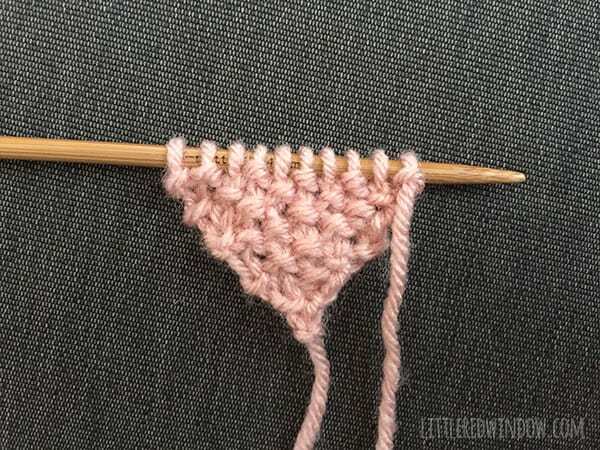 Wind the pink yarn around the three fingers of one hand at least 100 times. The more times, the denser your pom pom. Cut another piece of yarn about 18 inches long and tie one end of that very tightly around the center of the wound yarn. Leave the other end of this center tie long to attach the pom pom to the hat. Using sharp scissors, cut the loops on either side of that center tie to release the pom pom. Trim your pom pom as necessary to make it nicely and evenly round. Thread the long end of the center tie on your yarn needle and use it to sew the pom pom to the top of the hat. Make sure it is attached securely as this is an item for babies. Hi! I was JUST curious why you add the two stitches after creating the rim of the hat? It says to make the seed stitch work but with those two the rows begin and end the same so there are 4k or 4p in a row. If you leave them it works out nicely. Is there a reason for them to be there like that?